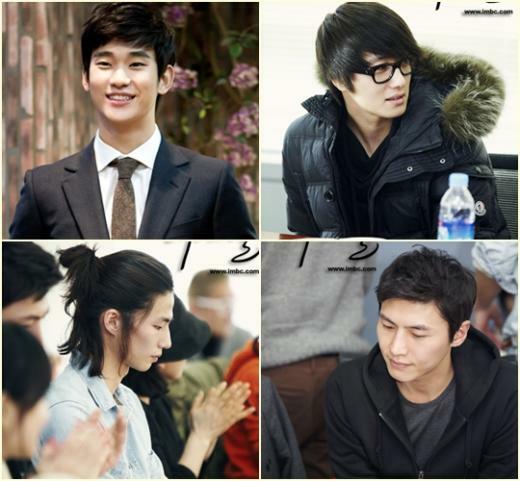 Four handsome actors Kim Soo Hyun, Jung Il Woo, Song Jae Hee and Song Jae Rim is forming a team of F4 quartet in MBC drama series The Sun and the Moon (The Moon that Embraces the Sun). Song Jae Hee and Song Jae Rim are playing the role of elder brother of Heo Yeon Woo, Heo Yeom, and imperial bodyguard of Lee Hwon, Won, respectively. Together with earlier casted actors of Kim Soo Hyun and Jung Il Woo who are playing the role of Lee Hwon and Prince Yang Myung respectively, they are forming a Korean four-person flower boy group. The Moon that Embraces the Sun is a drama adapted from the popular novel of the same name by Jung Eun Gwol. Previously the other work of the author, Sungkyunkwan Scandal was also been adapted and aired on KBS to popular reception, and thus the new drama is gaining attention from the audience. The drama is a collaboration between Sungkyunkwan Scandal screenwriter Jin Soo Wan and MBC’s Royal Family director Kim Do Hoon. Currently, the filming for the child actors’ segment has been completed, which lasts a total of 6 episodes. The The Sun and the Moon premieres on January 4th, 2012.